Jeffery Rand is an agent with British Intelligence. Rand, whose first name is sometimes spelled Jeffrey, is a expert specializing in codes and cyphers, though he quickly becomes quite good at being a detective as well. Rand is the Director of the Department of Concealed Communications created in 1963. Long before the days of one-time pads and 64-, 128-, and 256-bit encryption, the men and women of this agency worked to crack the codes of the enemy and to create encryption methods for its own side. Born in 1926, Rand is 39 years old when the first story appeared in 1965. Unmarried, he is said to have an eye for the ladies but lacks the drive to maintain a lasting relationship, at least for the first few years. As the series continues, he eventually meets a half-Scottish, half-Egyptian woman named Leila Gaad, falls in love after a time, and then marries her. After his retirement from the Department, the two take numerous trips to interesting places, giving him even more opportunity to get into trouble. Rand loves a good puzzle and cannot resist when one shows itself. Nor can he sleep when one is still nibbling at him and he takes on an almost-childlike excitement when he begins to see the solution, a trait that is infectious to those around him and humorous to his wife. 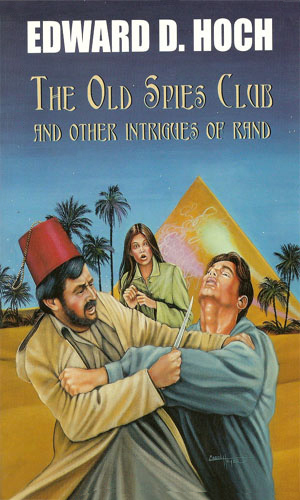 No novel was ever written about Rand - all his adventures are told through short stories published in the pages of Ellery Queen Mystery Magazine. Three books were published containing some of the stories, with a fourth mentioned in one of the books but not verified by me as yet (though why would he lie?). In total, approximately 81 stories were written about Rand from the first in 1965 to the last published the year of the author's death, 2008. 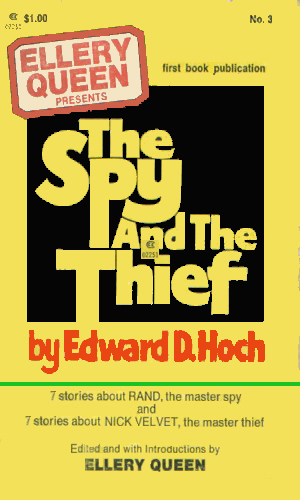 Despite the fact that Edward Hoch never wrote a novel about the spy named Rand, four books were released. Each of these contained a few Rand stories taken from the pages of the Ellery Queen Mystery Magazine. A couple of the stories appeared in more than one collection. A compilation of 14 stories from the pages of Ellery Queen Mystery Magazine. A compilation of 8 Rand stories. There were also a selection of Edward Hoch's Interpol stories and stories from other authors. The incredibly talented Edward Hoch created the character Jeffrey Rand as yet another interesting entry for the Ellery Queen Mystery Magazine and must have liked the man and the challenge of mixing espionage and mystery for he continued depicting cases/assignments for the next 35 years. In fact, only a handful of years did not contain at least two or three stories. Except where noted, all stories were published in Ellery Queen. Mr. Hoch's specialty was mysteries so that is the main emphasis for the Rand stories. He dealt more in breaking codes and later in solving murders than in espionage work but no list of spies would be complete without including the terrific tales that Mr. Hoch gave us over the years. I once worked in the field of code breaking but I never was in the league with Jeffery Rand. Too bad, too, because I think I'd have fallen for his eventual wife, Leila. What is interesting about Rand is the truth he shows about code breaking and how man-made codes can be broken by another man if enough of the puzzle is visible. It just takes time and patience and often a matter of understanding the man who wrote the cypher.